Summertime has left the Northwest, leaving the golden days of Autumn to take her place. We had a really great summer here, lots of nice days, plenty of hot days (and don’t tell anyone) hardly any rain. Really it was the perfect Northwest summer. On the 88th day of summer I decided to take a drive …. to the coast. The ocean had waited for me all year, thru late winter and all of the damp spring, I didn’t want summer to slide into fall without some sand between my toes. And the weather was forecast to be perfect; 70’s with no wind! The pup and I jumped into the truck and went for a drive taking us through our small town, into the urban area around Portland and finally to Sunset highway; US 26 that ends at the Pacific Ocean in Seaside, Oregon. The drive was part of the reason for the journey. It’s pretty scenic, running through the field and hills that usher you into the coast range of mountains. I think the summit was around 1500 feet. The winding road is a pleasurable challenge, and the traffic was nearly non-existent. 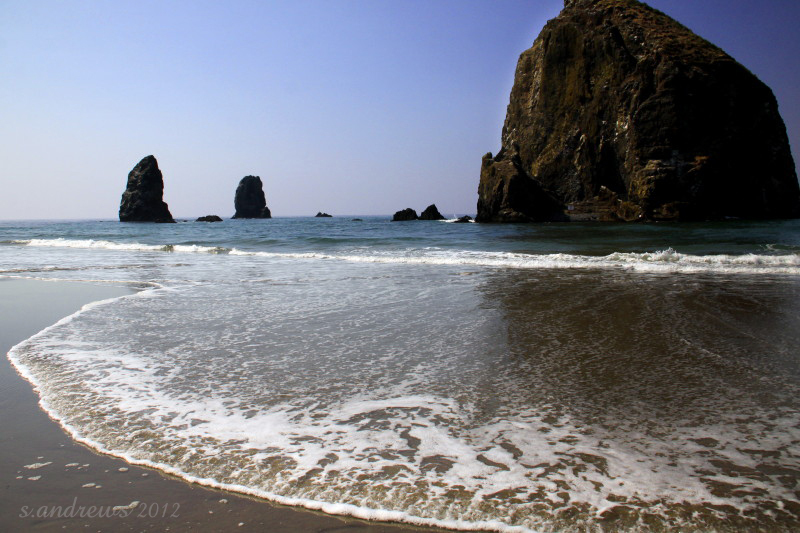 I reached my destination a bit after 12 noon, Canon Beach, just south of Seaside. The town was pretty crowded with shoppers strolling the sidewalks and chatting in the late summer sun. We headed out of town and found a street to park on with a path to the beach, just south of the landmark Haystack rock. We had found our spot for the afternoon! In the 3 or 4 hours that I was there I walked on the sand to photograph the rocks, ate the lunch that I brought with me, talked on the phone to hubby who couldn’t be there with me, walked the pup on the sand …. you get the idea. We talked to many others out there enjoying the calm, 70 degree day; a woman from Ohio visiting her son and seeing the Pacific for the first time, an elderly man visiting his daughter, and when Rayne decided to chase a long-haired Chihuahua I got to talk to a newly engaged couple; she was from North Carolina and he was from Beaverton. We had a nice chat about the dogs and the sites to see on the coast. My intention was to leave before the sun went down, and I did manage to tear myself away. 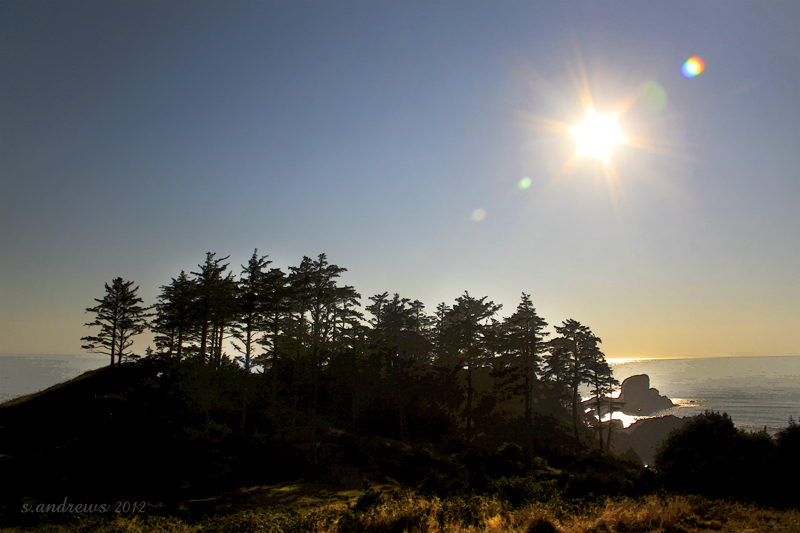 But not before one more stop, to the viewpoint at Ecola Beach State Park. The winding road to the park was worth it, when I get to the cliff overlooking the water the sun was just beginning to dip into sunset mode, and I captured some great pre-sunset photos. As I drove away I realized how relaxed I was from my short day at the coast. There is something about the light of late summer, and the sun moving so much faster across the skies. I just love it. Here are some of the photos from that afternoon. 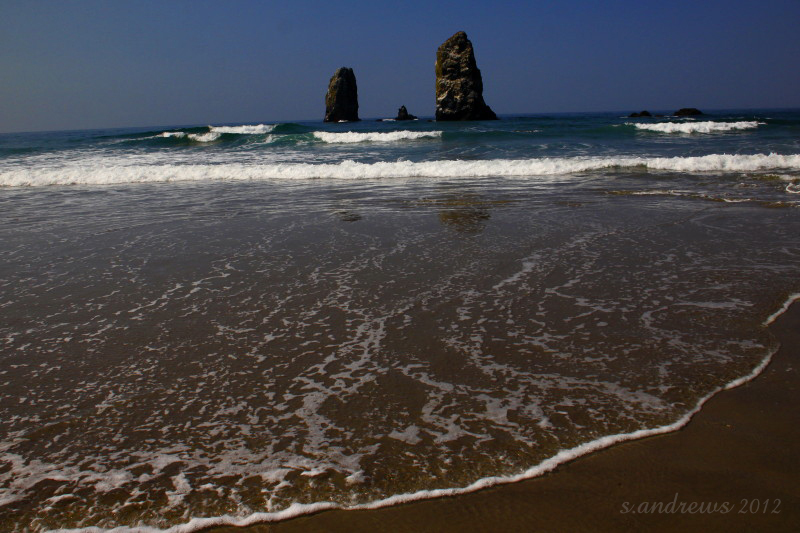 Nothing too dramatic; just the blue sky, the rock formations and the surf against the sand. 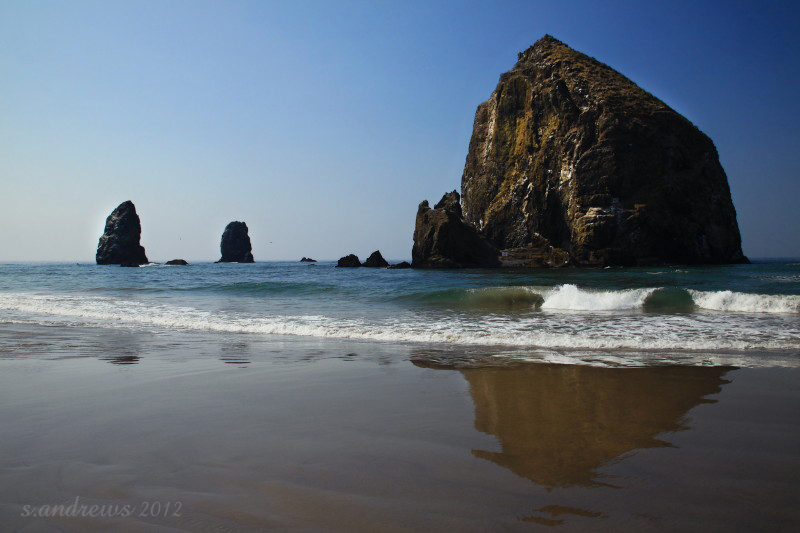 Haystack Rock takes a back seat to the lacy surf in the foreground. Haystack Rock and the Needles, a coastal landmark. The landmark made to look like a painting. The Needles in the background of the incoming tide. 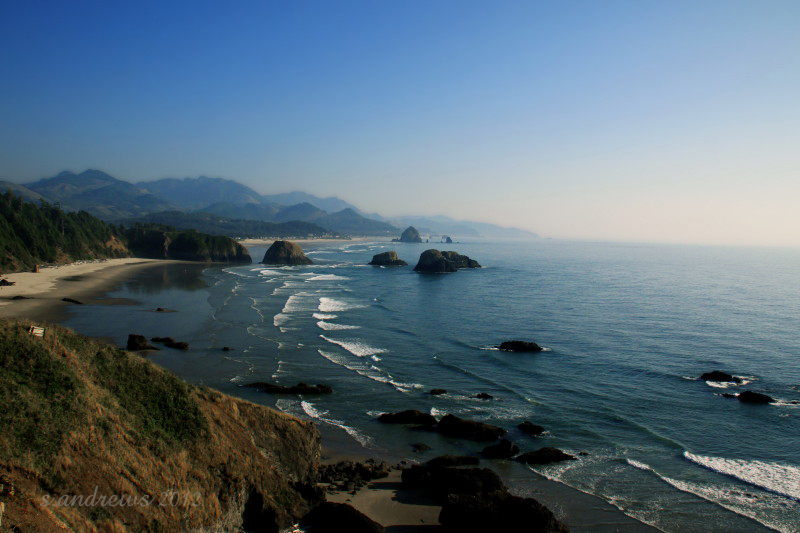 * Ecola beach is where the Lewis and Clark expedition traveled to see a beached whale, accompanied by Sacajawea. 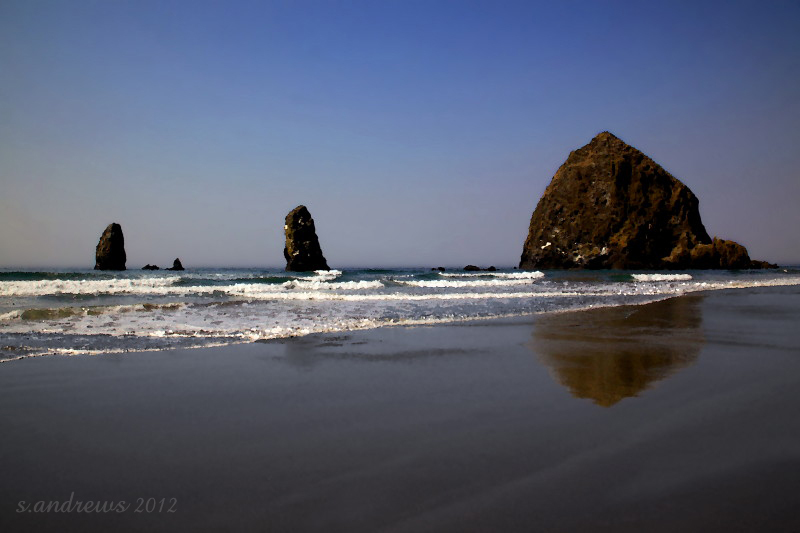 They called the beach Ecola after the Chinook name for Whale. 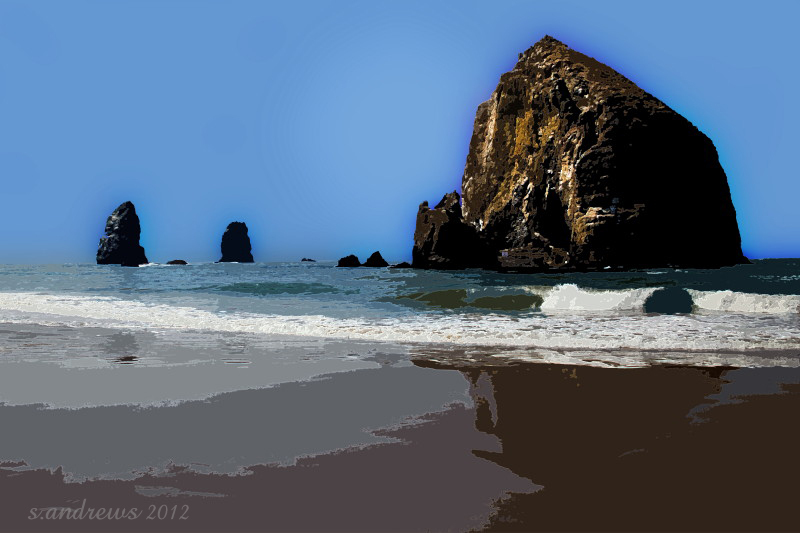 This entry was posted in Oregon, out and about and tagged beach, Canon Beach, Ecola Beach state park, Haystack Rock, Ocean, Oregon Coast, sand, September, Summer, Sunset, surf, surfer, The Needles. Gorgeous! What a nice getaway. I wish I was close to a big body of water. Of course, San Diego is only about 5 hours from Phoenix but we never drive there. As strange as this sounds, I still feel relaxed from that day alone on the sand. I often wonder, what is it about the ocean that we love so much?